People who are better educated are more likely to say they are satisfied with their lives, a study suggests. And they are more likely to say that the things they do are worthwhile, according to research by the Office for National Statistics. The study is part of a £2m project launched by the prime minister to try to measure people’s happiness and well-being. It does not say education necessarily leads to happiness. The researchers point out that many other factors affect the way people feel, including someone’s age, health, income and job. The study also shows that over time, the UK’s population has become better-educated. 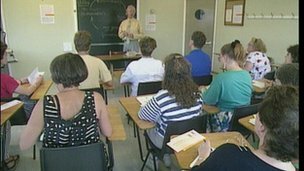 Between 1993 and 2011, the proportion of adults aged 16 to 64 without any formal educational qualifications has more than halved from 27% to 11%, it says. Meanwhile, the proportion with a degree or equivalent qualification has more than doubled from 11% to 24%. Among people with A-level or higher qualifications, 81% rated their overall satisfaction with life as seven out of 10 or more. And 85% felt similarly positive about how worthwhile they felt the things they were doing were. Among those who left school with no qualifications, 64% rated their happiness with life as seven out of 10 or higher. The researchers also quote from a study of the British Household Survey which found that people who were learning part-time in evening classes or in other ways were more likely to rate their well-being as high. And they point out that in England, while three-quarters of children from the richest families achieve five good GCSE passes (A* to C), only one in five from the poorest homes do so. The report is one in a series about well-being from the ONS. It is part of £2m national consultation launched by the prime minister in autumn 2010 aimed at working out how best to measure the nation’s happiness. David Cameron said he wanted more research on what mattered most to people, saying this could help shape future policy and gauge the effect of government action on people’s well-being and quality of life. The Labour Prime Minister Tony Blair had also looked at the idea of creating what is often called a “happiness index”.